Limited editon of 100 copies in various tones. 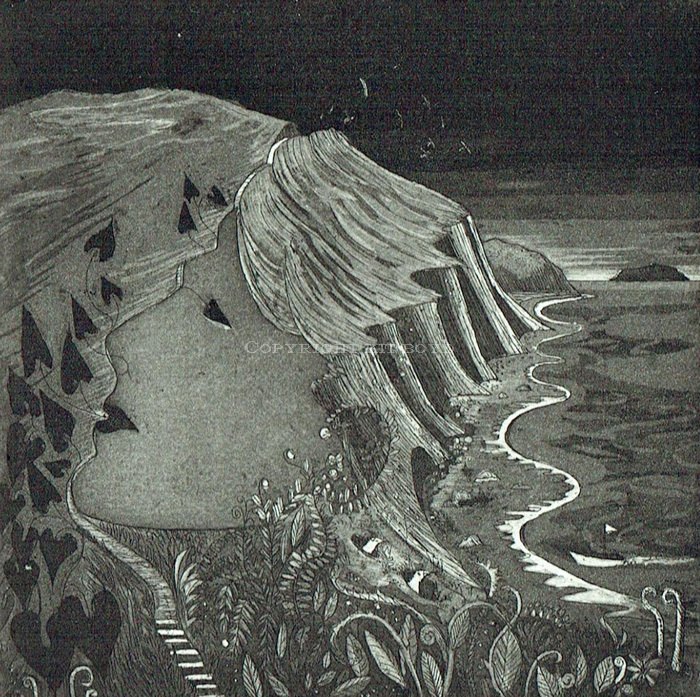 Following on from my collage and photoetching Wish You Were Here, this etching explores memory loss, with a human head merging with a cliff being eroded by the sea. The birds flying away from the cliff edge are symbolic of memories fading or being lost, as are the crumbling cliffs. The profile is of Rupert Brooke, who died in the war (and whose house I often cycled past as a boy in Rugby). I used to see the boys at Rugby School lined up in the grounds in their army cadet training gear, and think how sad it was they were being trained for war. The island is Skyros, where Rupert Brooke is buried and the imagery owes something to his romantic and patriotic poem The Soldier.